That's not what I meant at all! In fact, I just got a demo for a pretty cool fangame, I just meant that I had always stuck to canon up until I came upon Topaz. By any chance, was it Pokemon Uranium? Or not? Hm I don't think it works because I think quick reply and the posts are separate elements, so unless you do some heavy scripting it'd be at the top for everyone. But zeroality's really the one who can comment on this. ah okay, well i was curious if it mighta been possible without having to restructure teh entire site is all. also i thought it was interesting to have to go to the bottom of the page for it when the posts are up top. Uh, Virus, I think you have your forum settings strange, then, cause for me, and probably everyone else, the newest posts appear at the bottom. You know you have a problem when you’re exhausted but you force yourself to finish a story…that you don’t plan to show anyone for over a week. You know you have a problem when you’re two stories into a series but have plot jotted down for another dozen. You know you have a problem when you’re three stories into a series and are trying to figure out, if each story is like an anime episode, how long would a story have to be to equal a movie? You know you have a problem when you start to appreciate how the words “You know you have a problem when you” line up perfectly on a page. You know you have a problem when you have seven of these in a row. And I’ve only got six. Must be fine. Seriously, all of these happened to me on the same day (today). I should go to sleep. I don't really think there's a problem with a lot of these, except not eating. I'm sure all of us experience most of those thoughts at one point or another. It's a relief to know that I'm not the only one who feels like this sometimes... but I still wish that writing and I could have a better relationship. It's a love-hate relationship. I love to write. I hate my writing. I like to think that I can come up with a good plot, good twists, decent characters. And when I put pen and paper together and start scribbling out my ideas, I'm pretty satisfied with the results. It's the computer that makes me angry. For a start, I don't like typing things that I've written on paper. But also, it seems like the computer makes my writing worse. Example: I type out a nice, two-page story (or Topaz Adventures episode). As I'm typing, I occationally have trouble wording things right, making my meaning clear, and putting the right double entendre into areas that need more than one entendre. I correct, adjust, and fixate on certain sentances as I go, making the work take much longer than it ususally would but (I think) improving the quality of work. I love this part. It's mostly a pure flow of ideas, like my brain is flowing magic writing juices out through my fingers and squirting them all over the monitor. Then I reread my work. I notice things like unvarying sentance structure, over-clarification of points, and overused words. I try to fix parts that seem rushed, slow, abrupt, or out of place. I focus on thing that I would never notice in anyone's writing but my own. It's like a puzzle, trying to fix all the things that are wrong. This isn't the part that I hate. This part's fine, just part of the process. What I hate is that I'll do this over and over again. Every time I read my work, I'll see something that I did wrong, a place that the wording seems awkward or a group of too many sentances with the same, boring structure. Even when I finally feel I've reached an acceptable level of wordcraft, all I have to do is wait a week or month or a year, and eventually it will all seem wrong. It sometimes makes me angry when the people I ask to revise my stories don't notice all the glaring errors that I see. That's part of why I like releasing Topaz Adventures as small episodes. I'm obligated to release them on time, so I have to put them out whether I'm completely satisfied or not. Which I never am. But once they're on the internet, I never have to read them again, except to check for and fill in any plotholes. It's nice to complete something and have no choice but to let it be. Feels kinda nice to type that out, even though it doesn't really change anything. also is the black and white sequal 6th gen or still 5th? It would be 5th. There is no full generation of Pokemon coming out with it. Just realized that I recently beat an inactive member's (Quinn's) postcount. In celebration, I'm getting a new laptop! Actually, that second part's not true. I'm getting a new laptop for college, not because of postcounts. Although I will finally get PO and get on that Topaz+Other People server thing, and I'll be able to get that RPG Maker XP 30-day trial again, if we could use another person putting maps and stuff together. Heh, congrats, Cynda! What are you going to College for. I'm a be getting a laptop for college as well, so I expect you to post about how well yours runs, I may be interested in it! Computer science major. So I hope my laptop is good. Ultrabooks lack raw processing power generally so if you're looking to compile massive monstrosity code then it'll be fine but not optimal. I was actually looking at an Ultrabook myself: a Lenovo Ideapad. Lenovo's a generally good company so it might be alright. Well, I'm hoping that my code will be usable by people without massive proccessing power. 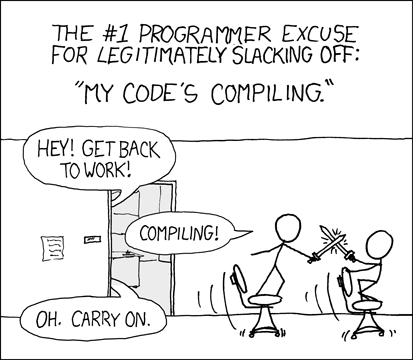 Also, if it doesn't take forever to compile, when do I get to have fun? Also, my college's engineering department should have more powerful computers if I need to do anything massive. might i suggest getting a different dell? I've looked at a particular portion of their site and found various PCs designed primarily for gaming (don't expect much cheapness though i'll post the prices) they've got some major processing power so if you need something done these should work. Everything seems to be doing great, but I've really only installed things so far. Heh, I want an Alienware, but I'll wait until I can save up the money for one. Well, tomorrow GLaDOS is getting a demo of RPGMXP, so I'll finally get to see and work on some of our maps. I'll probably get a full version later (in an unconventional manner). That should increase my productivity. Also, I've downloaded Pokemon Online, but haven't really tried it out much, and I can't locate the Topaz/Turquoise/Ever Grande City server. Is that down, or am I just being incompetent? IP changed? I knew the name. So, how exactly do you connect to a server? I tried looking for it in that list, but I didn't see it. Yeah, it was probably decided that the merge didn't do anything for EGC. I dropped the ball on this, sorry. It's not your fault. There weren't really a lot of Topaz people involved, and you've had your computer issues. How do you know that the name changed back? I'm not seeing any indication of the name. Also, I can't find anything saying that the merge ended. Last edited by Cyndadile; 08-09-12 at 07:48 PM. I just advanced connected to the IP I put there, and it was back to Ever Grande City. On the other hand, I have a new Lenovo Ideapad. It seems okay now that most of the updates have gone through. I'm just getting it setup now. I love being in a college with an official Pokemon League. I might try the card game for the first time since first gen. It's homecoming today. I may or may not be drunk as I post this. It may or may not be 9:00am. It may or not be my plan to sustain this state for at least the next 13 hours. I love how you confirmed you own post by forgetting the "may" in the final sentence. Today, the world was supposed to end. However, that did not happen and I got incredible luck today. This and the fact that I just now heard that the Mother series MIGHT be rereleased in America (from a friend) makes tonight anything, but doomy.